Sales limited to Stock On Hand! 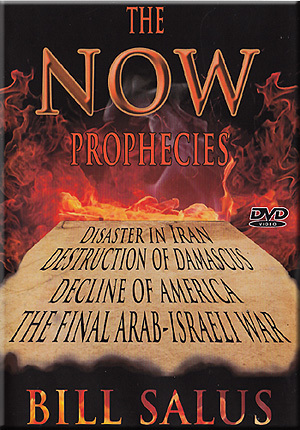 'Now Prophecy' DVD What does Gods Word say for us to prepare for NOW? What are the tough decisions we need to make? The NOW Prophecies identifies the biblical prophecies that were written centuries ago for THIS GENERATION! These ancient inscriptions predict powerful events that will profoundly affect everyone. This video makes it easy to understand how to get ready NOW for what to expect in the near future! The titles of these critical NOW prophecies are: Disaster In Iran! Destruction of Damascus! Decline In America! The Final Arab- Israeli War! 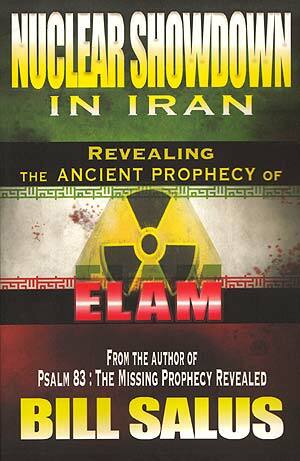 'Nuclear Showdown In Iran' BOOK Consider this most evil scenario regarding Iran, and compare it to God's prophecy of ELAM. 1) Missile cloud Mideastern skies over the Persian Gulf. 2) Iran shuts down the Strait of Hormuz. 3) Arab oil is choked off to world markets. 4) Hezbollah and Hamas abruptly launch thousands of rockets into Israel, overwhelming 'Iron Dome'. 4) Radioactivity permeates the skies over Iran from her earthquake-stricken nuclear power plants and contaminates the entire Arab world. 5) Desalination plants cannot process the polluted waters. 6) A humanitarian crisis has finally hit the Middle East. Save almost $15 by buying this DVD/BOOK Combo!